The material collected by Anwar Dil in the Bukhari memorial volume, On this Earth Together, is quite impressive as a tribute to the man who came to be designated by the Press in New York as the “diplomats’ diplomat”, “cosmopolitan crusader” at the UN, and finally as “citizen of the world”. Most of the text consists of Bukhari’s addresses at the UN and at some educational and cultural institutions in the United States. But about a half of the book comprises tributes from friends, colleagues and even enemies. The most interesting in this context are the tributes in the form of brickbats by Bukhari’s enemies and critics. The major complaint that has been registered by them against him is that Bukhari, despite his brilliance, failed to find and stick to his right vocation. Strangely, the complainants on this score have all defined his right vocation as that of a teacher – the one with which he started life. This may have been quite correct because the most profuse praises are to be found in the tributes by his pupils, colleagues and friends in the Government College, Lahore, where he was a student and teacher from 1918 to 1936. This was also the most creative period of his literary activity. An interesting fact comes to light when we read the tributes of some of his colleagues and friends at the United Nations, where he was known not only as the best speaker of his time and a “diplomat’s diplomat”, but above all, as a teacher par excellence. So he had not really missed his vocation, only carried it with himself from the college to the office of the Director-General of AIR, and later, to the United Nations. It could be truly said of him that he remained a teacher all his life, in whatever profession he adopted and whatever position he held. This reminds one of a story from his book Patras Ke Mazamin. It is entitled Anjam Bakhari (happy ending). It is a humorous fantasy in which a poor but brilliant teacher named Patras is visited by his three old pupils who present him with much ceremony an eight anna piece each, as the fruit of his labours expended on them and the recompense of his good offices. When his servant enters to demand his salary, Patras gives him the three eight anna pieces which the ungrateful servant throws in his face before leaving him. And then a gorgeously dressed stranger comes in and introduces himself as the highest official of the education department. He is followed by a number of servants bearing six big trunks full of gold coins, diamonds and other precious stones as presents from the King Emperor, the Price of Wales, the Viceroy of India and the Commander-in-Chief. Having bestowed all this wealth on the poor teacher, the Chief of the Education Department departs humbly and respectfully. Patras looks at the immense wealth brought to his house and dies of shock. This satirical piece reveals to the reader why brilliant teachers like Bukhari have to say goodbye to their vocation and seek higher positions in fields other than education. But they remain teachers, nevertheless, as we learn from tributes paid to Bukhari by his colleagues at the UN. The other vocation he is said to have missed was that of a writer. When Bukhari started writing he was interested in two forms of writing: fiction, especially in a humorous form, and criticism. Apart from these he got interested in writing for theatre, working mainly as a translator. Actually much of Bukhari’s writing was in the form of translations and adaptations. In the dramatic form this was mainly in collaboration with Imtiaz Ali Taj who was also his colleague in the theatre as an actor from as far back as the early twenties when both appeared in Bhisham Partigya, alongwith G.D. Sondhi, who produced the play and acted the title role. With Imtiaz Ali Taj, Bukhari translated Bernard Shaw’s Arms and the Man and Karel Capek’s R.U.R. However, the translations for which Bukhari was most well known were of R.L. Stevenson’s Markheim, the opera version of Anatole France’s Thais, and of Galsworthy’s The Apple Tree. It is interesting to note, in the case of all three, their high moral tone which was probably the reason for Bukhari to have chosen them for translation. 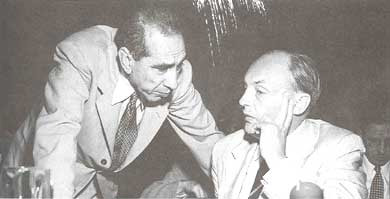 Contrary to his general reputation for frivolity, Bukhari was most deeply interested in the ethical and socially purposive levels of writings, as one can judge from the various essays he wrote for Makhzan and Kehkashan round about 1918, 1919, 1920, 1921 i.e. in the years that he was still a student. He took his Master’s degree in 1922, standing first in the university. One of the most important essays he wrote during his student days was the essay on Greek philosophers published in the Kehkashan issue of March 1919. This shows not merely a descriptive treatment of the subject but also an analytical one. The use of Persian and Arabic sources for the writing of this essay reveals that Bukhari was interested not only in the way that the West has dealt with Greek philosophy, but also the manner in which some of these philosophers formed a part of the Muslim (Arab) tradition. In this context also, we find Bukhari emphasizes the ethical choices that he made in the teachings of various philosophers. For instance, we find in him a keen admirer of Aristotle’s logical and scientific methodology, but he rejects the Aristotelian allowance for slavery. He is not much in favour of the mystical levels of Plato’s metaphysics, but we find him admiring Plato’s socialistic political form of the Republic. We find in Bukhari a great protagonist of the early Greek (Ionian) philosophers who talked in terms of atomism and phenomenalism. He rejects Parmenides for choosing stasis as the essence of reality and holds up the ideas of Heraclitus who realized the universe as a perpetual movement. Above all, we find Bukhari admiring Socrates as a model of ethical conduct and philosophical preferences. It was in Socrates that he found a proponent of the permanence of ethical values on which alone it is possible to build a stable society. From the world of senses he went forward to the world of intellect by which alone human beings can have a knowledge of eternal values in this world of constant movement and change. Bukhari’s study of ancient Greek philosophy must have left a permanent imprint on his mind. We find in his behaviour and social conduct something of the Socratic preference for dialectics as well as for communal and convivial companionship or what is known as his majlisi life – his interest in social dialogue and discussion, seems to be his desire for the search for truth – in general as well as in detail. We find this search for truth and morality as the basis of human society in the inner dialogue of Markheim after the murder of the shopkeeper. For Bukhari to have chosen Stevenson’s famous story of the inner working of a murderer’s mind, something on the same lines as we find on a vaster scale in Dostoevsky’s Crime and Punishment, is a part of his life-long search for a socially relevant and moral basis of conduct, something which a human being chooses for himself voluntarily and not as forced on him from outside. In Thais we find Bukhari choosing for translation a dramatic piece based again on a moral thesis. Perhaps Anatole France had not written his famous novel as an exemplar in morality. Perhaps he was most interested in the dramatic change of roles between the courtesan and the monk. One wonders if Bukhari was conscious of the fact that an original of Thais could be found in the story of Sheikh Sanaan in Attar’s Mantiq ut Tair. I cannot agree that in the midst of a literary life which was full of Persian classics, Bukhari was not aware of Attar’s story, while every person, even the illiterate ones of that time, had heard of Sheikh Sanaan and his fall from grace for the love of a courtesan whom he had converted to the right path. However, we do not find Bukhari making any mention of the story of Sheikh Sannan, or Attar and his Mantiq ut Tair. Thais is a famous dancer and courtesan of Alexandria who has been regarded by the high and low as a menace for society and good conduct. A monk from a monastery in the desert is bitten by the bug of reform and makes up his mind to bring the dancer on to the right path and Christian morality. He goes to Alexandria inspite of the warnings of his superiors at the monastery that his venture is a dangerous one in which there is a possibility of temptation spoiling his game. Ataneal, as the name of the monk happens to be, does not heed their warnings and leaves the monastery for the duel with the devil in Alexandria. There is a great furore in the public of the sinful city when they hear of the objective of the monk. Ataneal has a number of discussions with Thais who gradually succumbs to his preaching and finally agrees to leave her profession and enter a convent in the desert. Despite the opposition of the mob, Ataneal is successful in carrying Thais with himself and both arrive at the monastery where Thais is admitted as a bride of Christ. Ataneal leaves for his own monastery but now his own mind is disturbed. While he has successfully brought Thais away from the path of sinfulness and on to the path of God, he has himself fallen prey to the temptations of the devil. When he hears that Thais is seriously ill and is dying, he leaves his monastery and goes to her convent. While she is dying and seeing visions of heavenly peace and the angels coming to take her with them, Ataneal declares his love for Thais and desires her to live with him. The roles are reversed; the saint is converted into the sinner and the sinner becomes the saint. Why did Bukhari translate this opera into Urdu? Our answer can be that he was fascinated by the powerful dramatic reversal of the story. But a more cogent reply can be the social awakening in our society at that time to the inner weaknesses of the holy men and the pirs, which were becoming quite apparent. That this was not merely a matter of social realization of the dark aspect of the excessive piety and asceticism of some holy men in our midst, but a universal phenomenon. We find a Hindi version of Thais about the same time in the form of the novel Chitralekha, which was later made into a very fascinating film by Kedar Sharma – incidentally along with Balraj Sahni, a pupil of Bukhari and a student colleague of his in the Government College Dramatic Club. In all communities there was a growing realization of the psychological failure of the ascetic ideals. Another choice of Bukhari for Translation about the same time was Galsworthy’sThe Apple Tree. Again there is a strong element of morality in the story. The emphasis here is on the loosening of the ethical bonds among people in large cities and upper levels of society. They story is not very unusual. Wherever there is a meeting of the unspoilt human element in the midst of nature with the emotionally weak individuals from the urban areas, there is bound to be a tragic dimension to it. Our society was full of such incidents at the time when in both cities and villages there was a constant movement of human beings. It was usually in the middle-class elements from the cities who were sometimes injected into the simple, uncomplicated life of the village people. Frank Asherest and his friend Robert Garton – students who had completed their college education – go on a hike through the Welsh countryside. Asherest is disabled by a swollen knee and decides to stop by in a humble farm cottage. He meets a young unsophisticated girl, Maggen, and falls in love with her during the short period he lives in the cottage. So intense in his experience of this uncorrupted natural contact that he decides to marry her. He promises to bring some money and clothes form a nearby seaside town, and to take her away to the city. He reaches the town and arranges for the money and even chooses the clothes he wants to take for Maggen. But then he comes across a friend and his sister who are spending their holiday at the seaside resort. One thing leads to another until Asherest falls in love with Stella – his friend’s elder sister, more eligible as a bride for the sophisticated young man than poor Maggen. He gives up all thought of Maggen and marries Stella after some time. Twenty five years later, Asherest happens to visit the same village and farm where he met Maggen and promised to marry her. He finds a grave in the midst of the intersection of the two roads – a custom by which the country folk do not bury the suicides in the common graveyard but at the crossroads. Asherest and Stella stop by for lunch near the farm. While his wife is making a water-colour of the scene, Asherest wanders around and finds out from an old man about the grave at the cross-roads. It was Maggen’s who had killed herself by drowning after she had despaired of the return of her lover. She had not been buried in the common graveyard. Nor under the apple tree as she had wished. She was buried at the crossroads to remind her lover of her intense love when he passed by twenty-five years after. This is a rather sentimental level of fiction, quite old hat from the point of view of modernist and post World War II fashions. But Bukhari spent his creative years in the period when such sentimental moods were common in the fiction of the East and the West. However, the basis, both of the sentimentality of the Apple Tree and of the psychological truth of Thais, is to be found in the total commitment to the moral ideals prevalent in society at that time. And that is Bukhari’s fundamental attitude. He remained a moral purist and an idealist all his life. So did most of his pupils.